The Archive of Our Own, recently announced as a 2019 Hugo Award finalist, is the OTW's largest project. With more than 31,000 fandoms, 4.5 million works, 1.8 million registered users, and countless guests, there's a lot to take care of. With the help of your donations, we work hard to make the Archive the best it can be. And don't forget, if you'd like to support the OTW on a continuing basis, you can set up a recurring donation. You can choose any donation amount for as often and as long as you want, and save up for one of our thank you gifts! The OTW's central mission is to preserve and promote fanworks and fannish histories of all sorts. At a time when other platforms are restricting and hiding user-generated content, this mission is more important than ever. We keep this mission alive through the work of our strong volunteer force and the support of your generous donations. Our Open Doors project is dedicated to preserving at-risk fannish content. Through the Online Archive Rescue Project, digital archives are imported and their content hosted at the Archive of Our Own. In 2018, Open Doors completed the import of 11 archives. For non-digital fanworks, there's the Fan Culture Preservation Project, a joint venture between the OTW and the Special Collections department at the University of Iowa, which preserves fanzines, fan art, and other physical documents. The OTW's Legal Advocacy project helps protect fanworks from commercial exploitation. Our Legal team helps obtain Fair Use exemptions from copyright laws for fanworks, allowing fans to create and share content without it being monetized or taken down by corporations. They submit policy comments and letters to governments around the world, advocating for fans and fanworks during the creation of laws. They also create educational materials about developments in fandom-related law, such as last year's news post explaining how changes to Tumblr's Terms of Service affect fanworks. As our October fundraising drive comes to a close, we at the OTW are yet again blown away by your support and enthusiasm. We began the drive with the goal of raising US$130,00.00, and thanks to you, we've beaten that goal. With 7823 donors from 93 countries, we raised a total of US$193,068.87. Thank you! Your donations make a difference. They allow us to continue our work with Open Doors, Legal Advocacy, Fanlore, Transformative Works and Cultures, and of course AO3. We can't tell you how grateful we are. And don't forget, even though the drive is over, you can still support the OTW. We accept donations year-round! 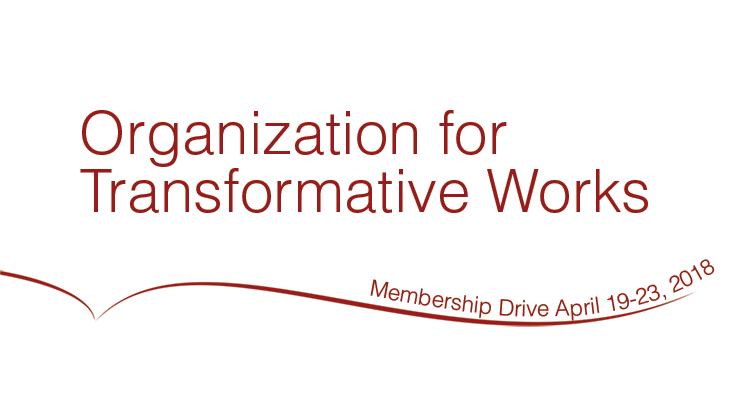 Do you love the Organization for Transformative Works? Do you love swag? Then we've got just the thing for you! When you make a donation to the OTW, you can opt to receive a thank-you gift. 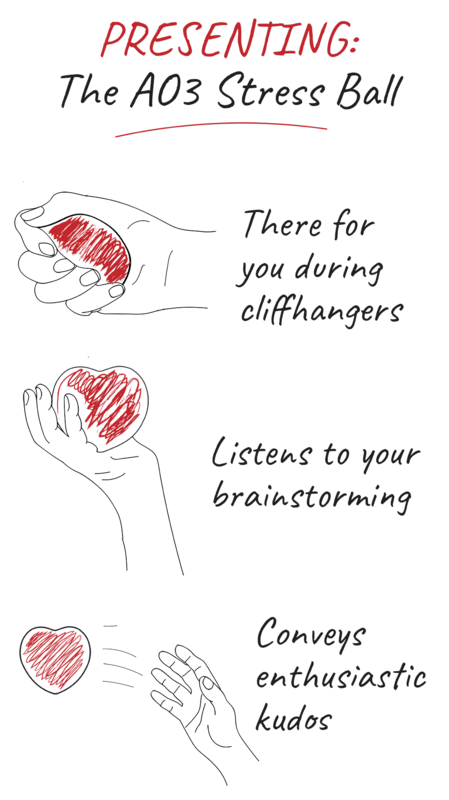 There are lots to choose from! 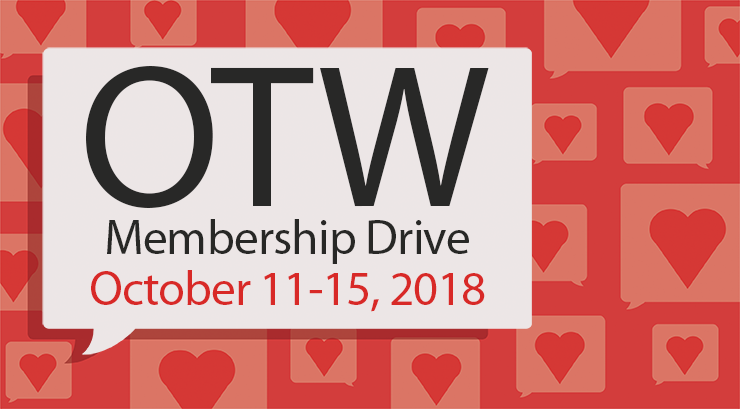 Show some love for your favorite OTW projects with fun project logo keychains--so whether you’re a fan of AO3, OTW’s Legal Advocacy, Fanlore, Transformative Works and Cultures, or Open Doors, there’s something just for you! Or you can celebrate them all at once with an OTW sticker set, which includes a full set of logos to decorate your stuff. And for those of you who are fans of kudos, we have a brand new thank-you gift: a heart-shaped stress ball with the kudos logo on it! Thank-you gifts are available for donations of US$50 and up. As your donation level increases, you become eligible for different tokens of appreciation. Check out our donations page for all the details. You can also make a recurring donation. As a recurring donor, you can choose a set amount to donate to the OTW at set intervals. This way, you can save up for any thank-you gift you want! Just sign up using our recurring donation page, then contact the Development & Membership committee and let them know which item you’re working towards. Once your donations reach the required total, your items will be sent your way. With any donation of US$10 or more, you can also choose to become a member of the OTW. That makes you eligible to vote in our Board elections, giving you an important say in the running of the organization. You can read more about voting and elections on our Elections website. Membership is valid for a year, so if you join today you’ll be able to participate in the 2019 election. And don't forget about employer donation matching. Since the OTW is a registered non-profit organization in the United States, many American companies will match donations made by employees. That means that when you make one donation to the OTW, we get two! To find out if your company participates in a donation matching program, ask your employer or tax advisor. Whether you’re a first-time donor or a frequent donor, your contributions mean everything to us. We wouldn’t exist without them. Please donate today! Your Donations Help Us Grow! As you may have noticed, Archive of Our Own recently upgraded its search engine. This change included a whole bunch of new highly requested features, and it wouldn’t have been possible without your donations! One of the big highlights of this upgrade is the new easy-to-use exclusion filters. Don't want any trace of angst in your fluff? No problem! Just select "Angst" from the list of Additional Tags to exclude. If you can't find the tag you want to avoid in the provided lists, just type them into the "Other tags to exclude" field. Want to get even more in-depth? There are some handy hidden search operators to help you find exactly what you're looking for. It's thanks to you that we're able to operate and improve AO3. Everything from spam detection to new servers is paid for using money donated by people just like you. And it's your contributions that let us hire reliable contractors to help out our all-volunteer main coding team and make major changes like our search upgrade a reality! You can check out our latest budget post for more information on how your donations are being used and what we're hoping to accomplish with them in the near future. And it’s not only AO3! While AO3 is the OTW's most visible and expensive project, we have a multitude of other projects that support fans and fanworks, and all of them need your support. Whether you’re a fan of our Legal Advocacy work, our Open Doors project, Fanlore, or Transformative Works and Cultures , you can help support them by donating today! It's almost election time! 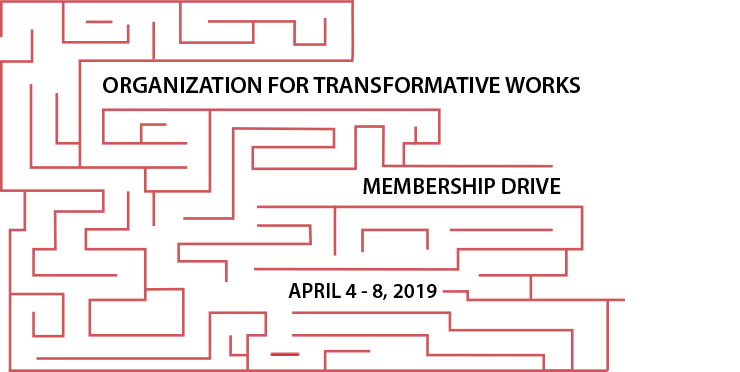 The Organization for Transformative Works (OTW), the nonprofit behind the Archive of Our Own, Fanlore, Transformative Works and Cultures and other projects, will hold elections for its Board of Directors from August 10th to August 13th. In order to vote, you need to be a member of the OTW by midnight UTC on June 30, 2018. That means that you have to have made a donation of US$10 or more since July 1, 2017 AND have chosen the "membership" option. If you're unsure whether this applies to your donation, please contact our Development & Membership team. If you participate in this Voter Registration Drive, you will receive a specially designed icon, only available during this drive. Thank you for your support of the OTW! Register to vote and donate today! You've Helped Make A Difference! And don't forget, even though the drive is over, you can still support the OTW. We accept donations year round!